Kitchen units, cupboards and cabinets are the focal points of your kitchen. With so many designs available, it can be a little overwhelming choosing the right units for your kitchen redesign project. Think about the decor you’d like in your kitchen as a starting point, keep in mind the layout you want and space you have available, and select your kitchen units based on this. Once you have your basic kitchen units and cupboards selected, that’s where the fun can really begin; built in wine racks, special storage units and microwave housings are all available. Then you can get creative with new kitchen doors and stylish kitchen handles. All our kitchen carcasses are manufactured in the UK and can be made to measure. The kitchen is the heart of the home and where you spend the most time with your family - you want it to shine. By selecting made to measure or standard size kitchen units, you can design your kitchen layout around your requirements and kitchen shape. You can create as much storage, worktop and counter space as you want, meaning that no area is wasted. Quality is a key consideration when buying bespoke kitchen cupboards and units. Some homeowners complain that their expensive, brand new kitchens start to deteriorate almost immediately after being fitted. This happens because people are drawn into what they believe are ‘good’ offers by kitchen companies - without reading the small print. You might think you’re getting a good deal but really you’ll end up paying more for poor materials. Low quality materials just aren’t going to cut it here. This is why we only use the highest quality materials for our range of kitchen units, cabinets and cupboards. 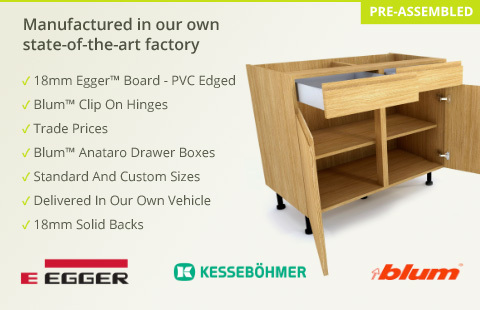 We only use melamine-faced chipboard by the EGGER company, which is renowned for producing high quality wooden boards. You’ll also notice that all our kitchen units come in 18mm thicknesses. Typically, 15mm and 18mm are considered normal for kitchen cupboards (although some companies offer kitchen cupboards that are a mere 12mm thick). However, we know how sturdy kitchen cabinets really need to be, so we only offer the thicker, more rigid 18mm option. While you could get away with a 15mm thickness, the extra 3mm just give a bit of a buffer, ensuring that your kitchen units stay standing upright no matter what you throw at them. Size is important when designing a kitchen. You’ll need to make sure that you pick the right sized units to make the most of the space in your kitchen - make sure that distances between your base units and wall units are correct. If it’s a completely new kitchen, you’ll also want to ensure you’ve considered all the other necessities, such as plug sockets. 600mm width is the most common standard size for kitchen units. Widths of 300mm, 400mm, 500mm, 800mm and 1,000mm would all also be considered standard size carcasses. 600m length units will be fitted with a single door while the larger sized cabinets would usually have two doors. The heights of kitchen units can vary, but kitchen worktops and are usually fitted at 910mm. This is to make sure that your countertops are easy to use, and you can manoeuvre around the kitchen sink. For empty spaces, corner units and L-shaped units are an ideal solution. For drawers, you’ll often see base units with a traditional single draw set, or drawer-only units, with a stack of three or four drawers.